It's all well and good having autonomous vehicles, cars that talk to each other and smart glass-enabled machines buzzing around the streets of the future but what about the roads they travel on? That cracked piece of black tarmac in front of your house may not look like much but engineers and brilliant minds across the globe are busy coming up with ways to transform our streets and highways into intelligent pieces of tech that can not only communicate with the world around them but also potentially charge electric vehicles on the move and warn drivers of upcoming dangers. Roads aren't the only things that are long overdue a high-tech overhaul, as street furniture - such as signage and lighting - is also being experimented with and trialled as you read this. Dutch design house Studio Roosegarde has been raking in the awards for its ground-breaking glow-in-the-dark road surfaces, which employ special paint that can react to light and temperature. The photo-luminescent paints have already been applied to a number of roads in the Netherlands and they work by harnessing the sun's energy by day and glowing in the dark for up to ten hours overnight, reducing the need for energy-sapping street lamps. Next on the agenda is dynamic paint, which will reveal large snowflakes on the road surface should the temperature drop below freezing, warning drivers to take it easy on the slippery blacktop. Studio Roosegarde has also acquired funding to develop wind-powered roadside lamps that can sense a car approaching and increase light intensity accordingly. Electric cars are becoming increasingly popular as global manufacturers, such as BMW, Nissan and Renault, continue perfecting and improving the art of emissions-free motoring. However, one element that remains firmly stuck in the past is the bothersome task of charging one of said electric vehicles. Wires and cables have to be dangled out of windows if you live anywhere that's not large enough to boast a garage or driveway (that's most of us, then) and public charging spots typically require a subscription and an ID card, which have both been known to let electric car owners down in times of need. BMW is already working alongside Daimler to develop and refine wireless charging stations, which simply require a specially designed receiver plate to be fitted to the electric or hybrid vehicle in question. Power is then electromagnetically transferred between charging coils embedded in the tarmac to the receiver plate, meaning cumbersome wires are committed to the history books. The technology is still in need of some improvement as vehicles must be in the perfect position to ensure power isn't lost during the charging process. Toyota is busy developing autonomous parking cars, which guide themselves into induction charging spaces, while BMW's offering uses Wi-Fi to instruct the driver on exactly where to park for optimum charging. 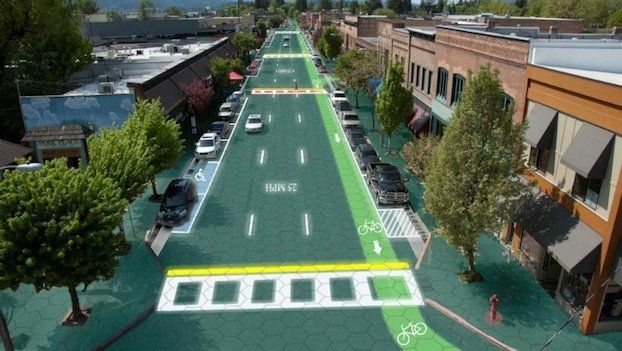 Forget simply adding a splash of fancy paint to existing tarmac roads, American Kickstarter project Indiegogo raised twice the amount it needed to develop its solar roadways programme and it hopes to roll out this completely new road surface in the USA over the coming years. The modular paving system consists of recycled reinforced rubber solar panels that can be used to pave roads, driveways and pathways, which will then convert the sun's energy into electricity to be used by local homes, businesses and the road network. Better still, each panel features hundreds of LEDs that, when plugged into the main highway computer, can project traffic information directly onto the road surface, doing away with the need for countryside-spoiling signs and other ugly road furniture. These tough panels can also be warmed through, meaning snow and ice is melted without the need for salt spreading. What started as co-inventor Julie and Scott Brusaw's pipedream has now gathered pace, as a number of US towns have signed up to pilot the project but, with more refinement and bigger budgets, the couple hope to roll out a fully developed product by 2016. A number of European manufacturers have already joined the Car 2 Car Consortium, an association that is busily working out how to wirelessly share information between vehicles. But it is also the job of the road and its numerous signs and lights to keep traffic flowing. In the not-so distant future, GPS systems in cars will communicate with roadside 'listening stations', which in turn will gather information from vehicles and other road furniture hooked up to a wireless network. The idea is to speed up the flow of traffic should an incident occur. For example; a car breaks down in the outside lane of the M25, its on-board computer will immediately alert the road network, the Highways Agency is called and given accurate GPS locations of the vehicle, the surrounding signage receives a notification to warn other drivers of an obstruction in the road and directs traffic around it accordingly. Traffic jams and enormous tailbacks could, theoretically, become a thing of the past but if they do rear their ugly heads, cars with autonomous driving abilities will be able to take over the driving (or crawling) duties as soon as they are notified of a jam. Thus freeing up time to play Candy Crush Saga or catch up on missed EastEnders episodes. Trials are already underway on the A14, as large sections of the road have already been internet-enabled. Experts believe this is the first step towards truly autonomous driving.